One of my goals for the New Year is to really start sticking to a thorough skincare plan to really address my acne scarring, under-eye darkness, and skin dryness. In October, I had a Kiehl’s professional measure the hydration of my skin with their special tool and it came out as severely dehydrated. This girl has some THIRSTY skin. I am going to be doing a post next week on hydration for the winter, so more on that later. For now, let’s chat about the products I’m using lately to brighten up my face! Now a lot of the coloring on your face, like under and around your eyes, can be genetic, so it’s quite difficult for any products to promise to rid your skin entirely of that color. However, things like pollution, the environment, or allergies can contribute significantly to darkness under and around the eyes. 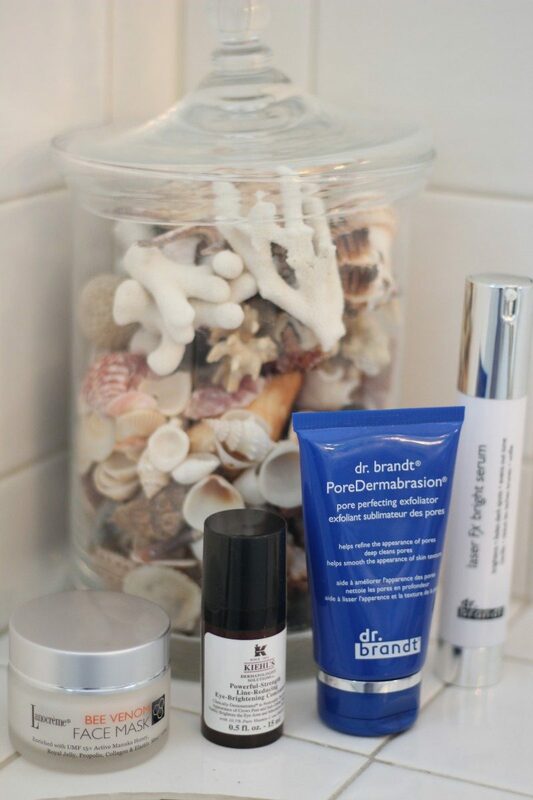 To address my under eyes, I have been using the Dr. Brandt laser Fx Bright Serum all over my face and the Kiehl’s Powerful Strength Line-Reducing Eye-Brightening Concentrate (that’s a mouthful, geez!!) to specifically target under eye darkness. I am also using these products to address the darkness of my acne scarring on my cheeks. I’ve struggled with acne since the sixth grade and I haven’t always been one to not pick at or touch my face. Hence, the scarring 🙁 With the brightening serum, I have noticed a reduction in the darkness of that scarring. Another thing that can improve the appearance of scarring is collagen. Products that increase or induce collagen production help to fill in the divets and rough texture left behind from scarring. This may sound crazy but bee venom products are key to enhancing collagen production. If you’re allergic to bees or have never been stung – do not try these products! I recommend this collagen serum as a replacement. If you have been stung and aren’t allergic, then l recommend this bee venom mask ($13 on Amazon, hey!!) or this bee venom cream (my nail lady said her daughter used this one and it literally took away her acne and smoothed her whole face…whoa). Because of the venom your face will think that it has been “stung” and plump up (no, not swell) and get to producing collagen and filling scars AND smoothing your overall face texture. Last but not least, I have been using this Dr. Brandt PoreDermabrasion to scrub away dark, dead skin and reduce the size of my pores for brighter skin! I use this twice a week and I have already noticed some amazing effects.